Schulz’s practice is about the preservation and mapping of personal and cultural histories through rigorous methods of production. It’s an impulse to record things and to display as data for analysis. Her work often employs a scientific approach to experiences, breaking down complicated emotional states or bodily realities into a series of mathematical decisions informed by archival impulses. The intimate experiences are exhumed in attempt to order information and frame meaning. Schulz focuses on labor, repetition and death through preservation to discuss the ways in which we perform for each other. The resulting works carry a tension that come from the attempt to order aspects of life that fall outside of easy categorization, or any categorization at all. She is drawn to subjects that reveal a vulnerable and repulsive side to ourselves we rarely choose to dissect; deinstitutionalization, environmental concerns, unreliability of memory, family dynamics, etc. Using these subjects as a point of departure, she choose to wade in discussions of intimacy and mortality. Though the initial subject matter tends to appear bleak, the process exhausts our anxieties. The work appears clean, organized, and comforting as a method of digesting emotional turmoil. 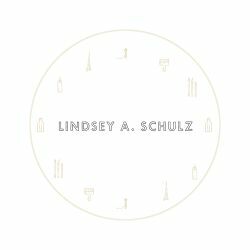 Lindsey A. Schulz was born and raised in Santa Rosa, California. She received her BFA from Otis College of Art and Design in 2011, and an MFA in 2015 from California Institute of the Arts. She currently lives and works in Los Angeles, California. "I would love to cast more objects, but I absolutely hate the process; I am awful at making moulds. Earlier this year I tried making a mould of a child's shovel to cast in a variety of materials, however it failed in almost every way. It needed to be so many more pieces so the shovel was partially stuck in the plaster. After i carved it out a bit, I went to pour the resin, and there must have been a weak point at the base of the handle, and the resin poured out everywhere. I decided to postpone this project till I have some knowledgeable help. I have had some success at casting, just not large or complex pieces. Maybe one day!" "I believe people will always have their own experience viewing work that cannot be controlled. Conceptual work specifically requires a lot from the viewer, both in time and thought. I always provide written statements as a way to allow people to enter the work and not feel excluded from the experience. Without having an expectation, I hope people are willing to learn about these subject matters I've put forth, as well as just being still. Allowing the work to come to you in waves. Formally. Texturally. Philosophically. Playfully." "Science is at the core of most of my work in some way or another. I listen to podcasts, watch documentaries, and read a lot to find narratives worth sharing. I spent a long time researching mental health, the history of treatments, deinstitutionalization, and specifically Thomas Kirkbride. I've read several books on memory, its unreliability, and other mysteries that occur in our brains. I am just finishing a project about the Salton Sea, the ecosystem which was introduced. It's a failure and the significance it has on the birds and Pacific Flyway, and the toxic impact it's having on the local population." "I am really drawn to work in spaces where the line in blurred between interior and the landscape. However in every single studio I've had (seven at this point), I've been obsessive about organization, grids, and natural wood." "Unlike most artists, I do not work consistently within the same medium or subject matter. I move from project to project, producing research based work in minimalist forms. The conceptual component of my work is heavily translated through my use of the material; bones, salt, beeswax, seeds, found artifacts, dirt and powders." "My projects take so long from idea to finished product, and while some go back to bake awhile longer, others die in my notebooks; that I am constantly working on several projects at once in order to be productive and prevent myself from burning out. They're usually completely thought through by the time I actually begin producing the work, so there is very little room for spontaneity." "The biggest obstacle (though lets be real, there's always many!) happened during my second year in graduate school. I loved being in school and thrive in that environment. I was reading about the beat generation, and had watched the movie Kill Your Darlings one too many times. I sincerely began to feel if I wasn't making work that I would risk everything for, it wasn't worth making. I wanted my peers to stand behind their work too so much so that they would walk away from a "CalArts MFA" for it. I began to hear the same language being repeated in these institutions which they wanted to hear, and saw the work they want to see. I began to feel crippled by my own expectation to make anything worthy, which took over a year to truly fight my way out of. Growth happens through the process, a many failures, while successful works are often small and far between. And the only way to make impactful work, is to just make work."